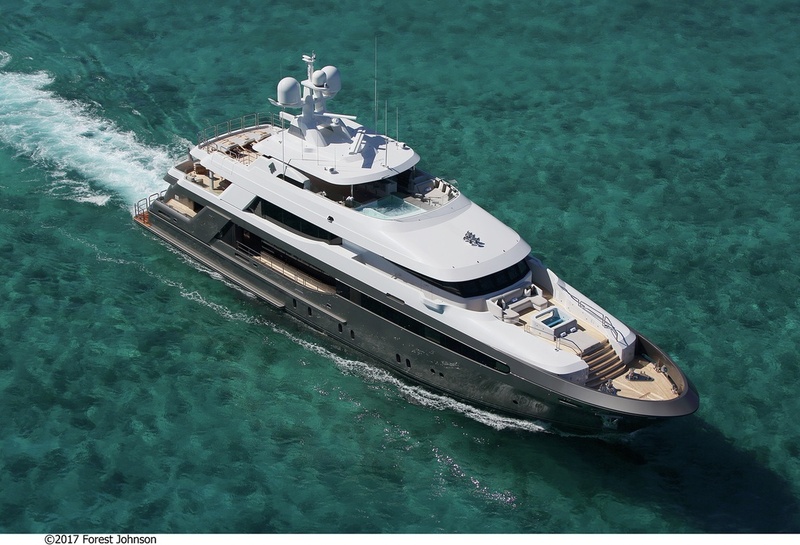 The 44m/144ft CRESCENT 145 LUXURY SUPERYACHT was built by Crescent Yachts in 2016 and features a striking charcoal grey hull and white superstructure. 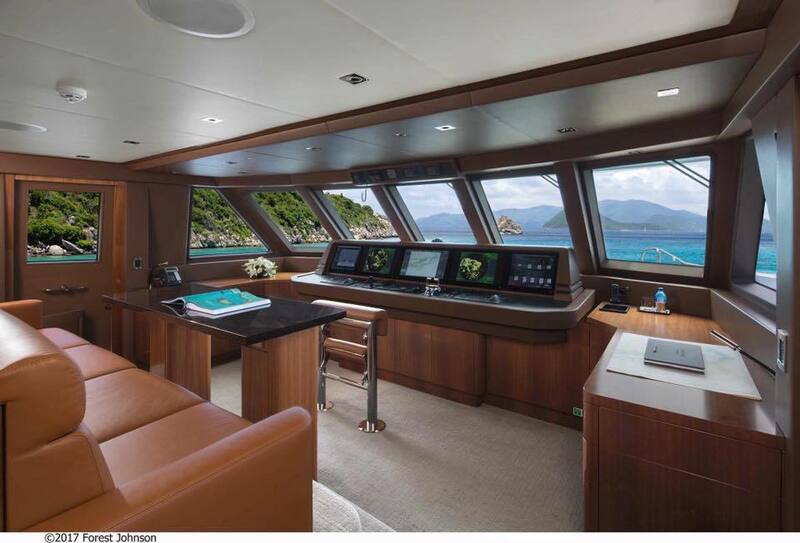 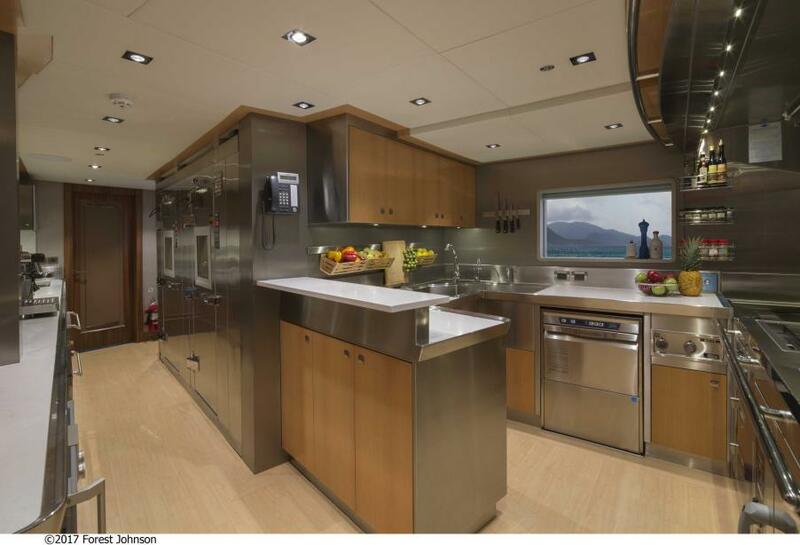 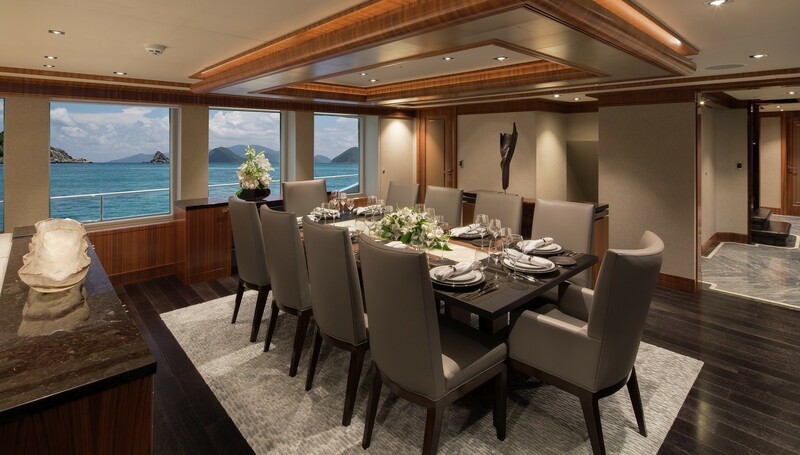 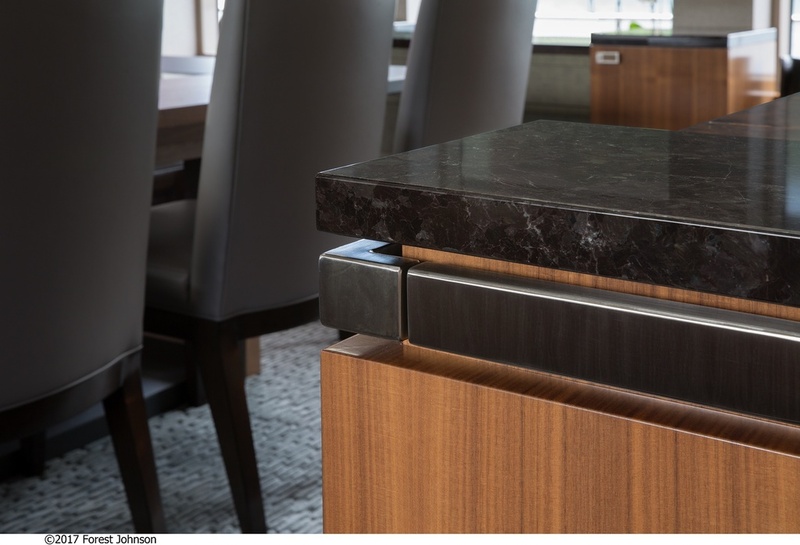 Jack Sarin Naval Architects, Inc. completed her naval architecture, while the interiors are the work of Jonathan Quinn Barnett, who chose an elegant modern colour scheme further enhanced by the use of precious onyx. 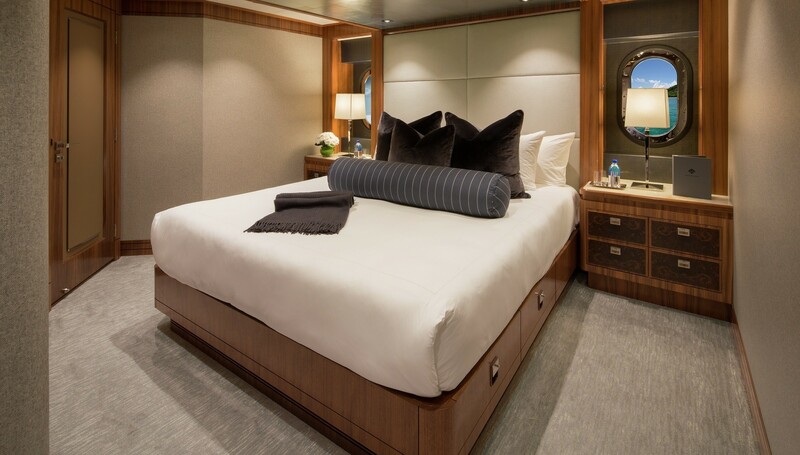 The accommodation sleeps up to 10 charter guests across five large en-suite cabins and a professional crew of 9 provides outstanding service to ensure guests have an unforgettable charter vacation. 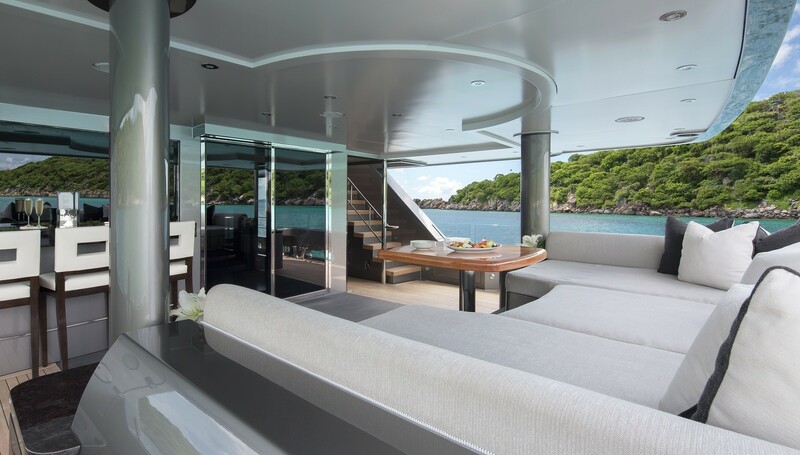 The lower deck swim platform leads into the large beach club, or alternatively, guests can climb the stairs to access the main deck aft. 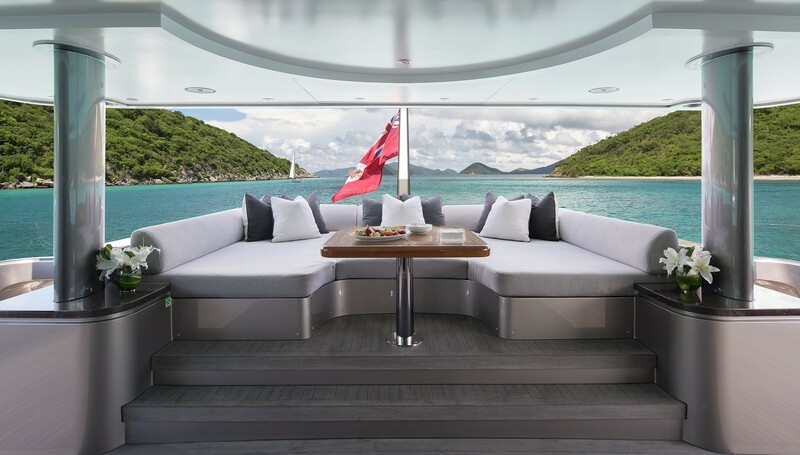 Here, the layout provides an extensive stern sunpad that can also be used as seating while dining alfresco at the raised table. 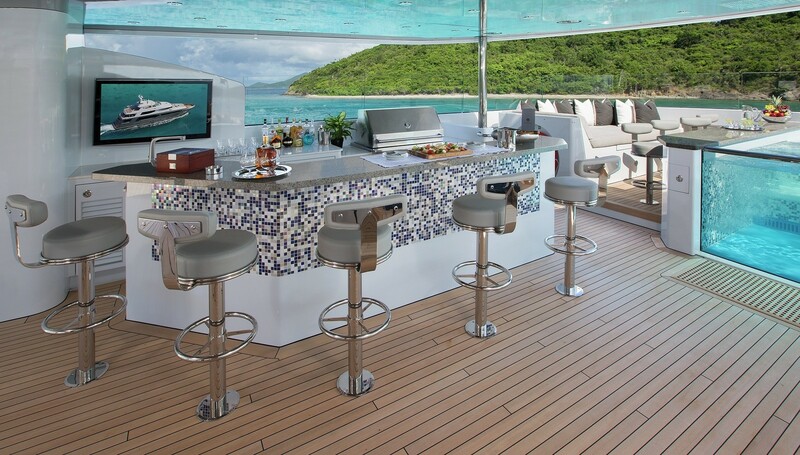 Forward, the alfresco section of the bar has three seats and a hatch for easy access to drinks from the main salon. 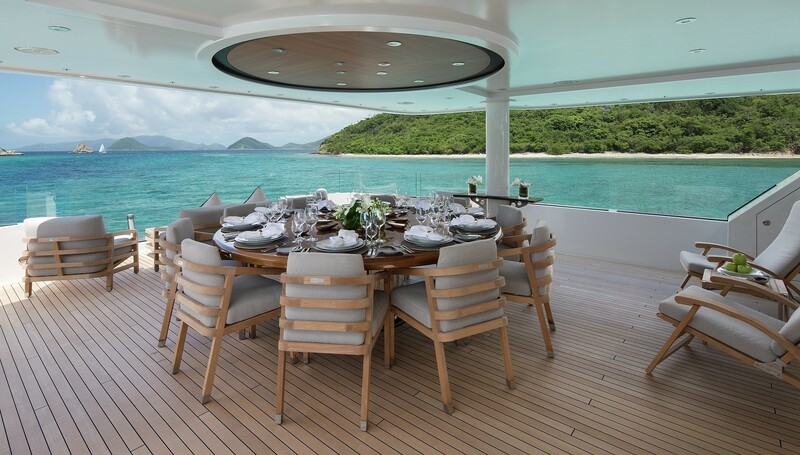 On the upper deck aft, the circular table will seat up to 10 guests to an alfresco meal sheltered by the sundeck overhang. 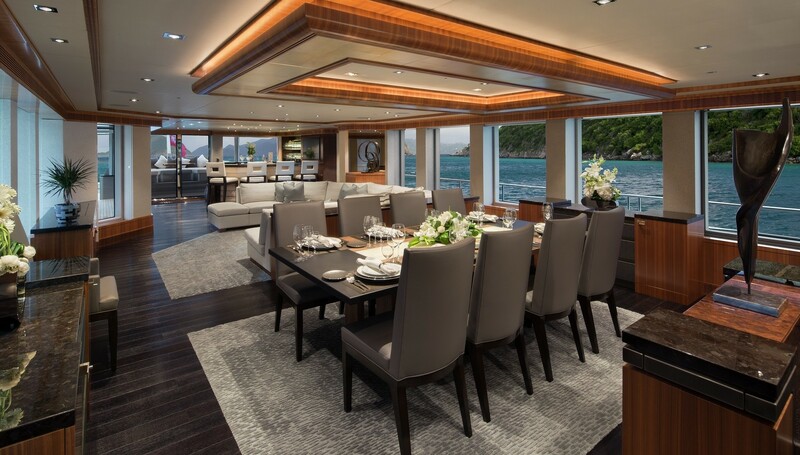 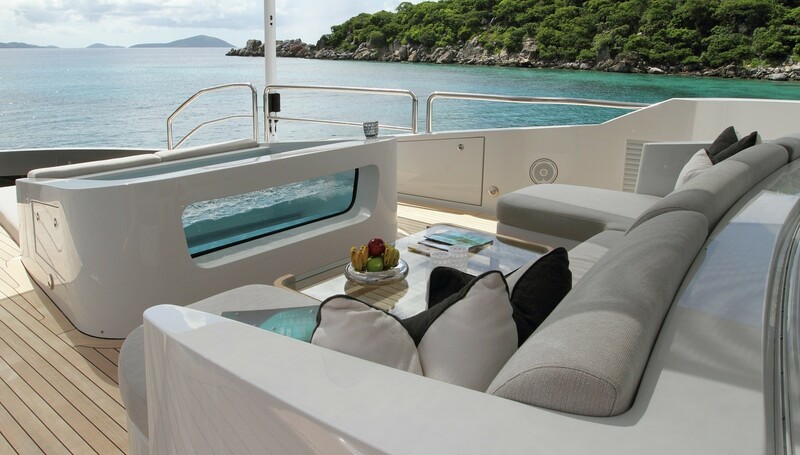 After dining, armchairs and drinks tables along the stern can be arranged into separate groups for a private conversation while taking in the views. 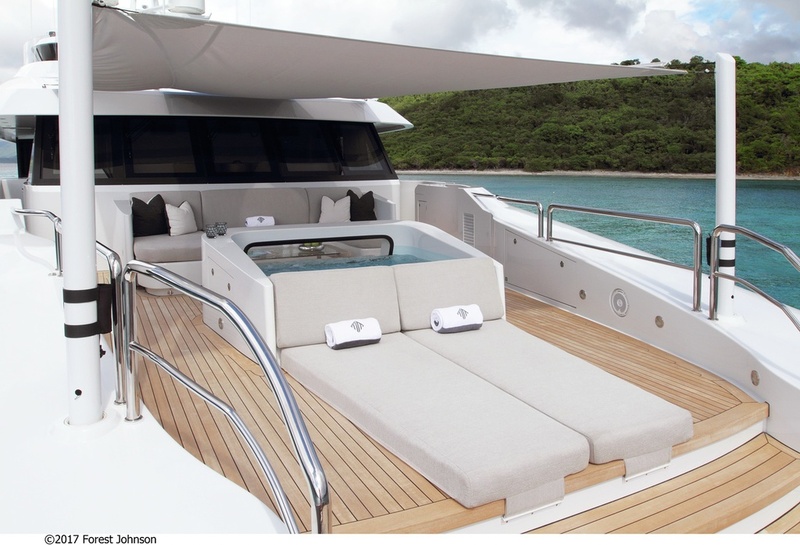 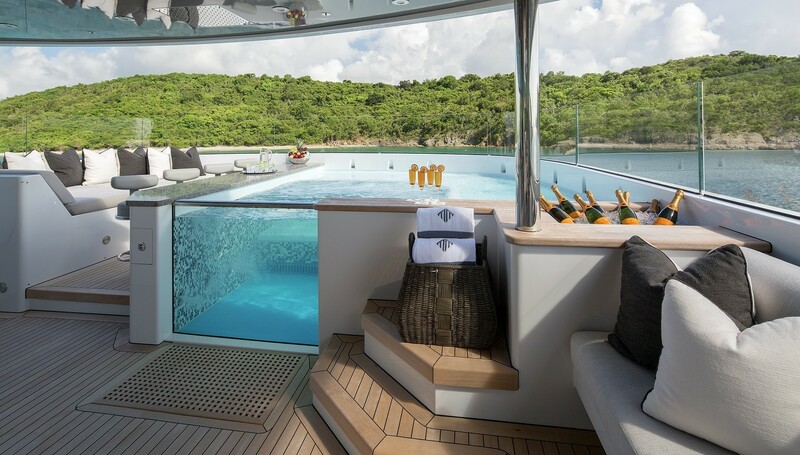 On the bow, a curved loveseat is placed in front of the helm station and farther forward a lavish spa pool allows guests to enjoy the sunshine before drying off on the bow sunpad. 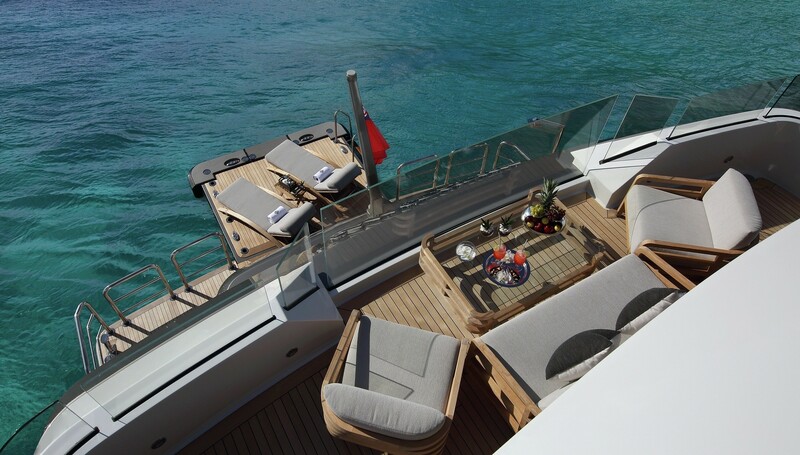 The sundeck provides ample space for sunbathing together: The forward area has a port-side sunpad while the starboard section has a massive spa pool with a glass side. 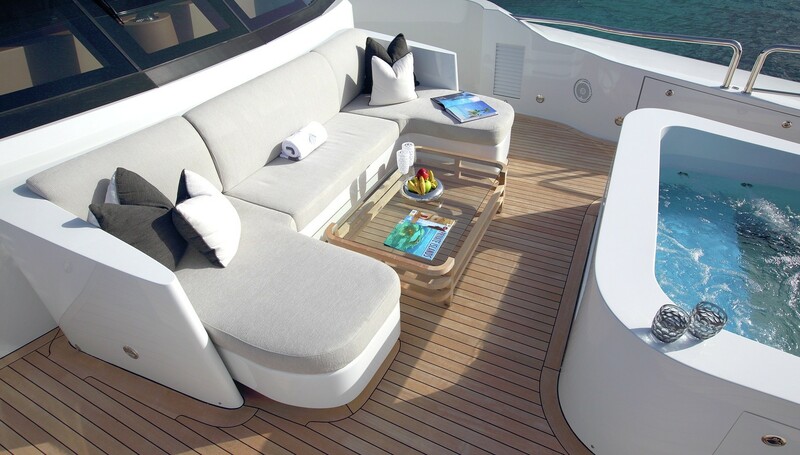 The mid-section contains a bar and on the adjacent side, there is casual seating where guests can sit and socialise while taking in the views from the shade. 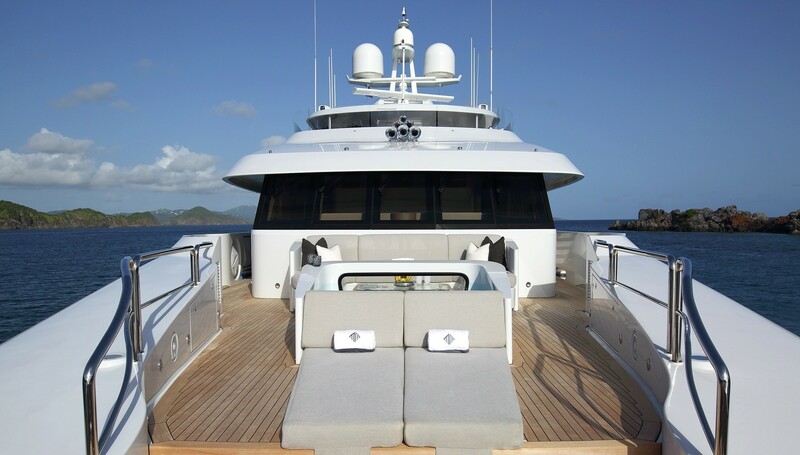 The sundeck aft is used for storing tenders and motorised water toys, which can be launched and retrieved using a Davit crane. 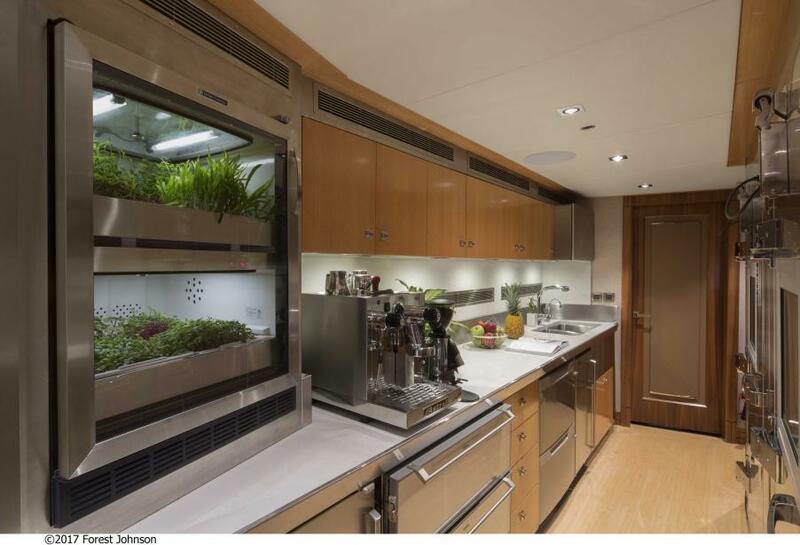 When empty, the area can be used as an additional workout space in conjunction with the gym equipment beneath the hardtop. 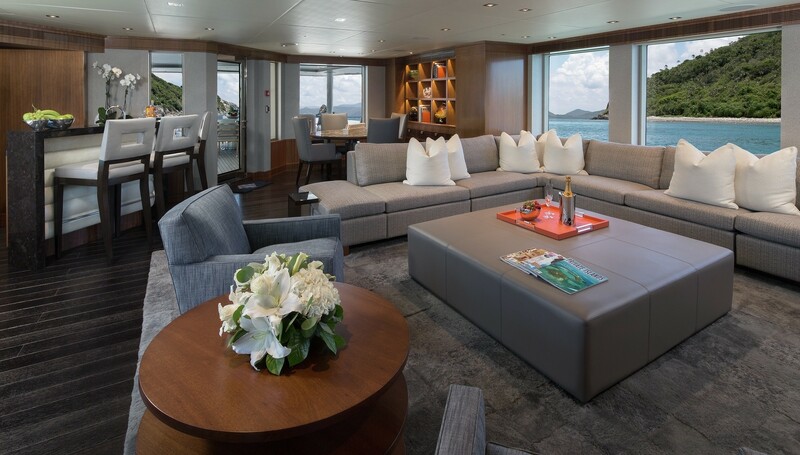 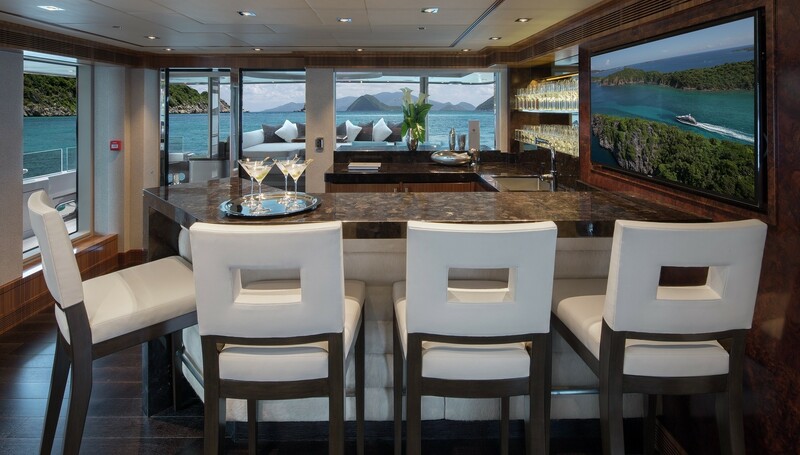 On the lower deck, the stern section hosts a spacious beach club for guests to unwind close to the sea. 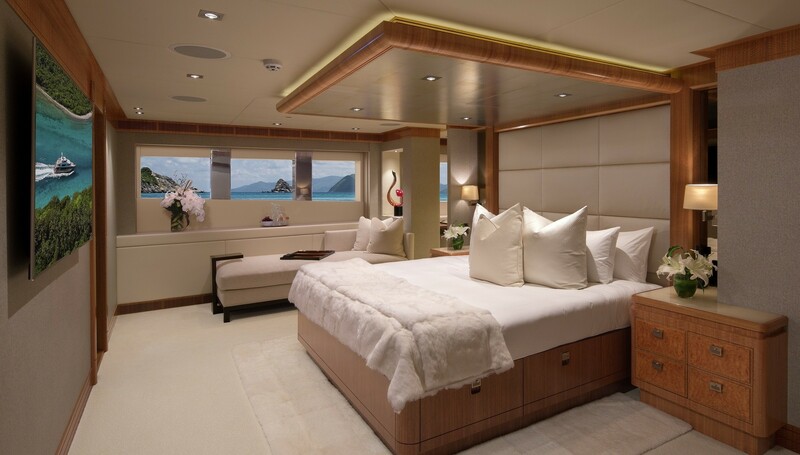 Forward of the beach club are the technical spaces and the engine room, leaving the section amidships for guest accommodation. 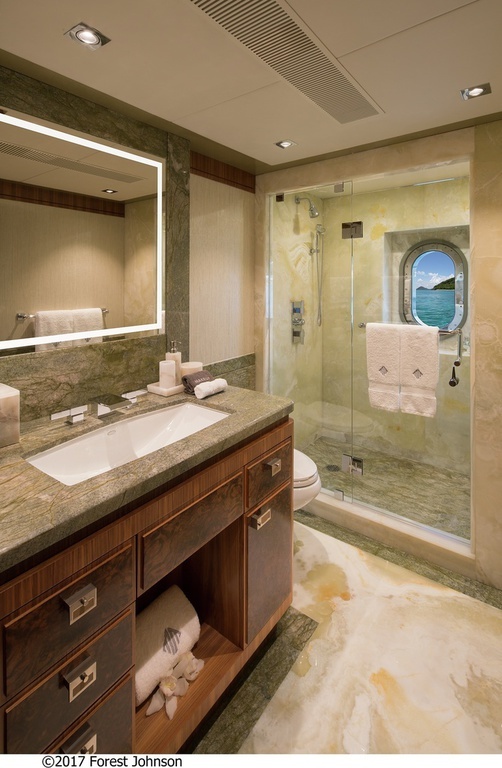 Here, the section contains two double en-suite cabins and two twin en-suite cabins that can be converted to lounges for the double cabins. 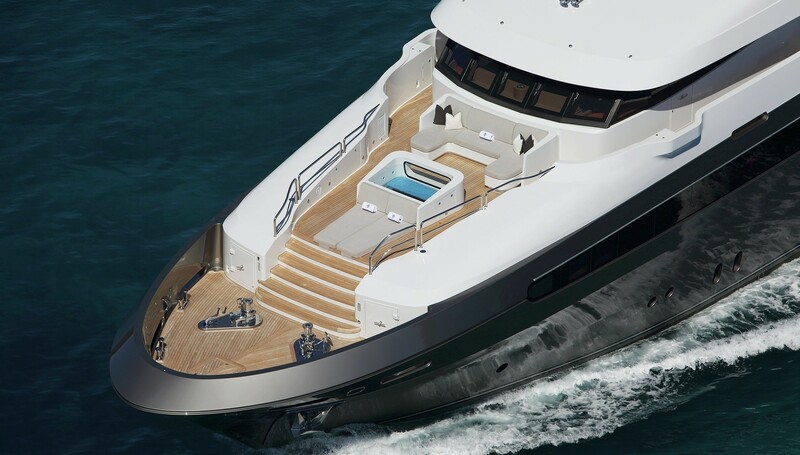 The forward section contains the crew accommodation and lounge/galley. 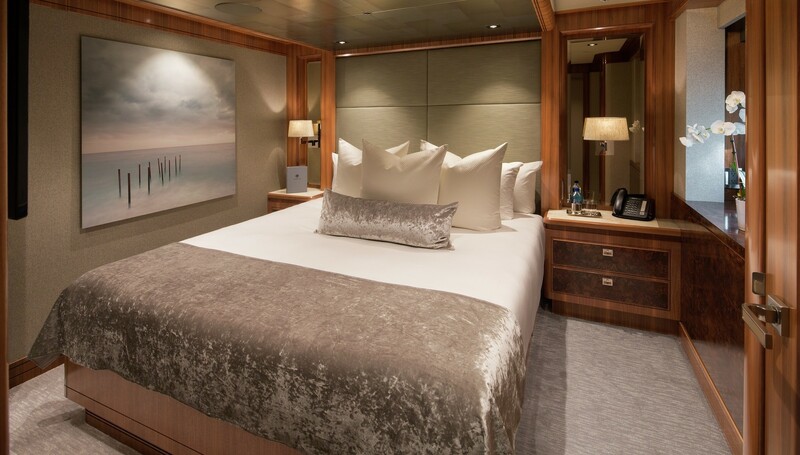 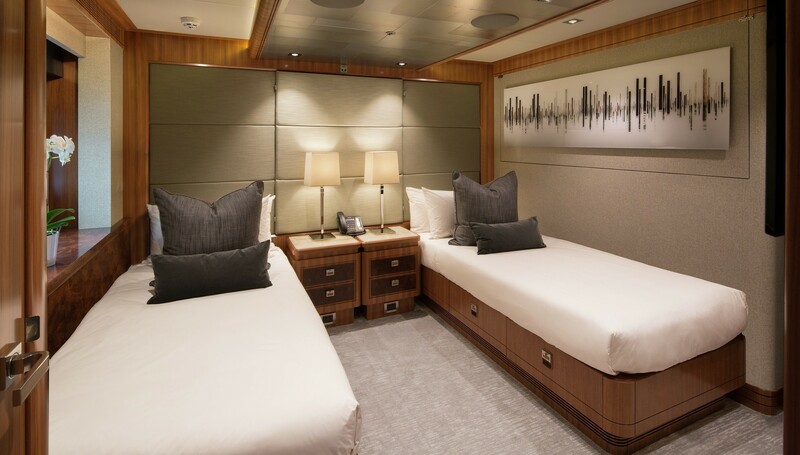 The main deck forward hosts a full-beam Master suite, within which there is a seating area and a widescreen TV opposite the bed. 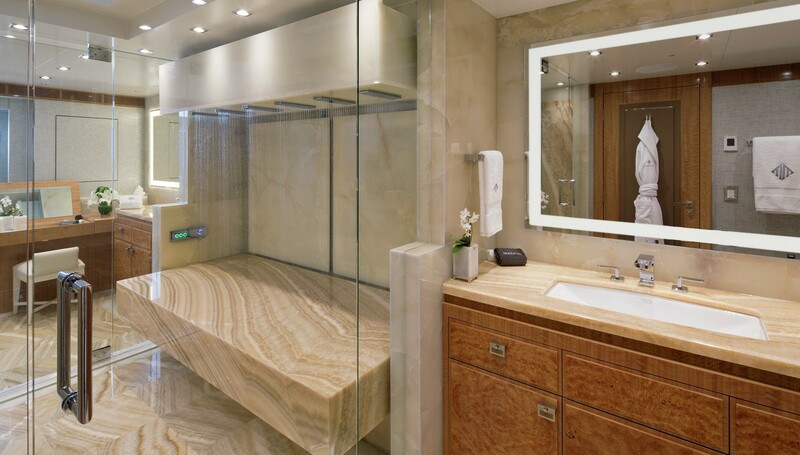 The bathroom is positioned forward and has his and hers showers, a therapeutic Vichy shower over a horixontal onyx bed and a skylight that allows moonlight through the Jacuzzi pool above. 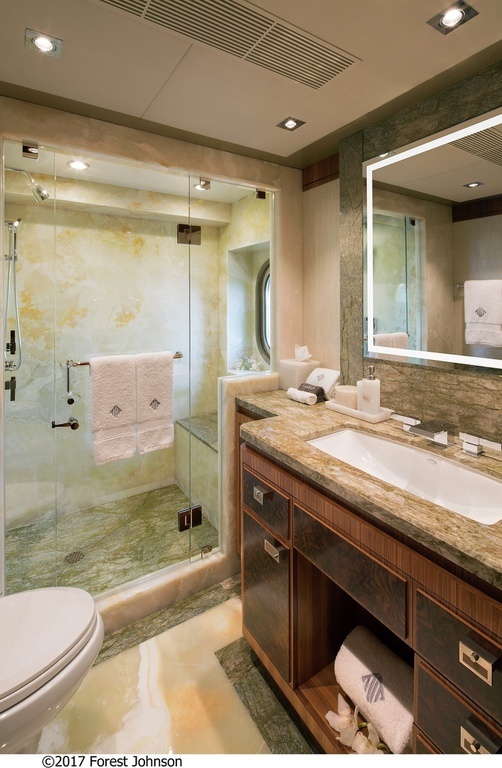 A walk-in wardrobe and study are placed behind the Master suite and complete its facilities. 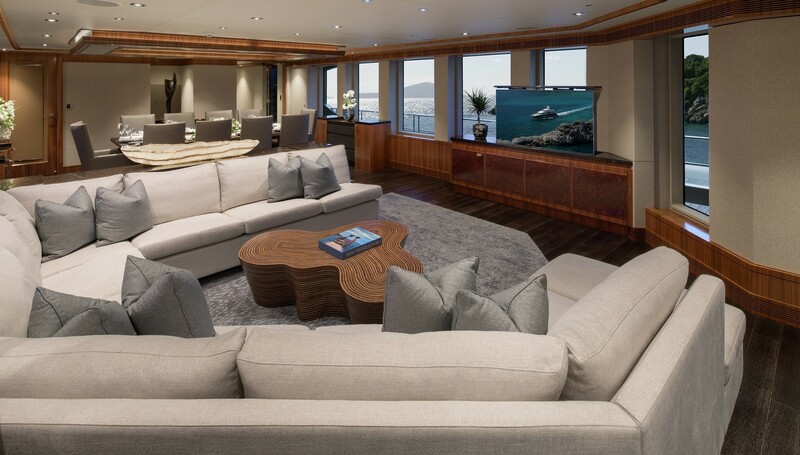 The main salon employs a curving sofa in the centre for all guests to gather together and enjoy the sunshine and views. 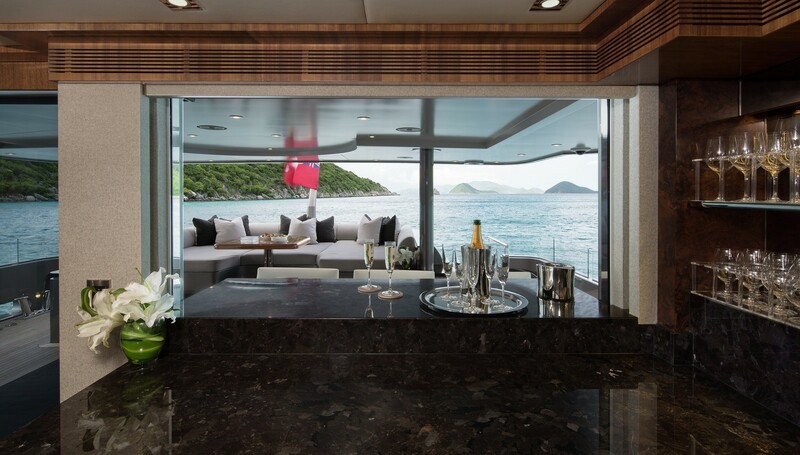 As a result of the effective use of space, there is ample room to the aft to incorporate a well-stocked bar with a widescreen TV. 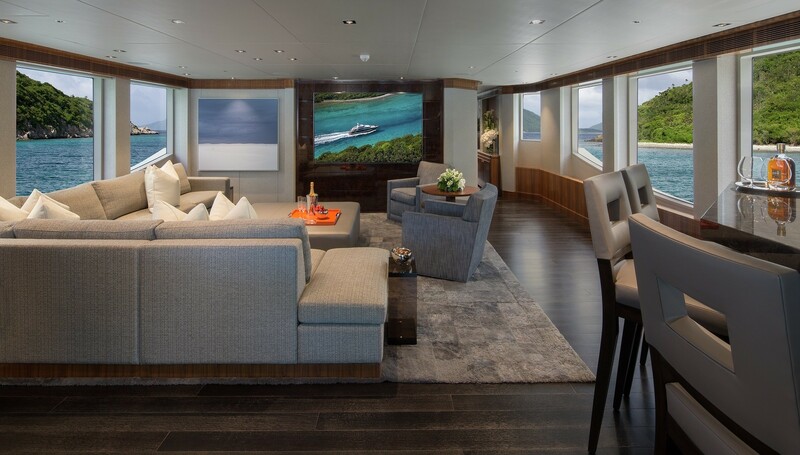 On the upper deck, the sky lounge is situated aft of the main foyer and similar to the main salon, the interior is flooded with natural light with the same sultry colour scheme implemented. 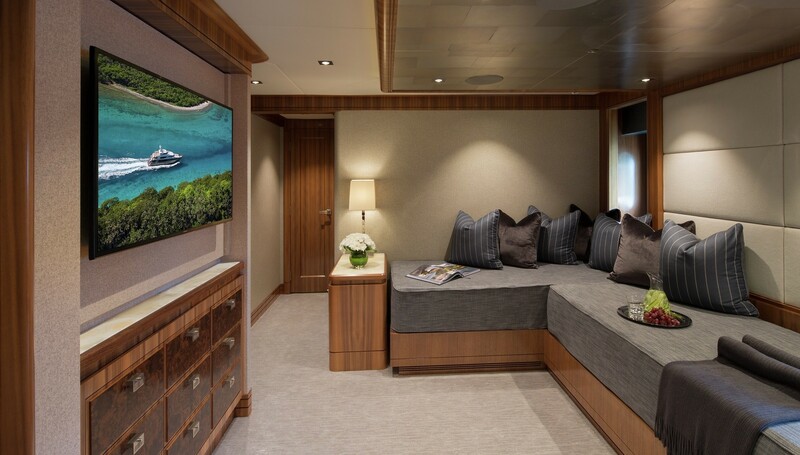 A generously sized corner sofa divides the lounging area from the rear wet bar and the games table beside the doors. 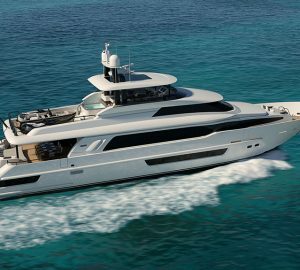 2 x 2040 kW MTU 4000 series M90 engines that each produce 2,735 HP allow for a top speed of 18 knots, a cruising speed of 13.5 knots and a range of 2,300 nautical miles. 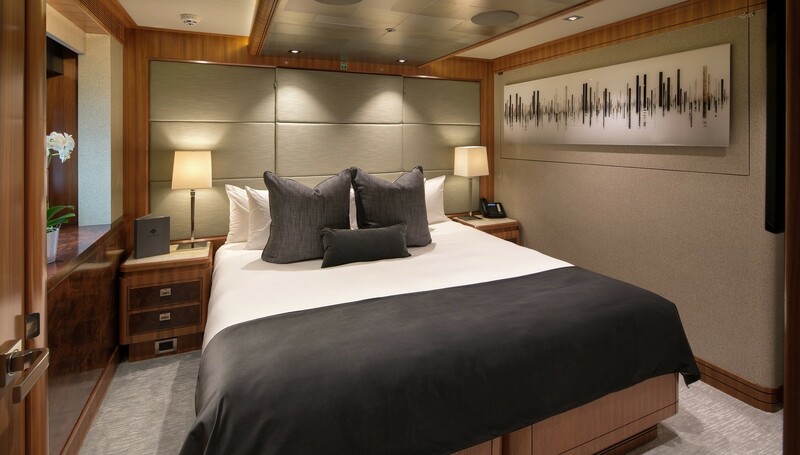 The accommodation provides for up to 10 guests across 5 large en-suite cabins: 1 Master suite, 2 double cabins and 2 twin cabins convertible to lounges for the double cabins. 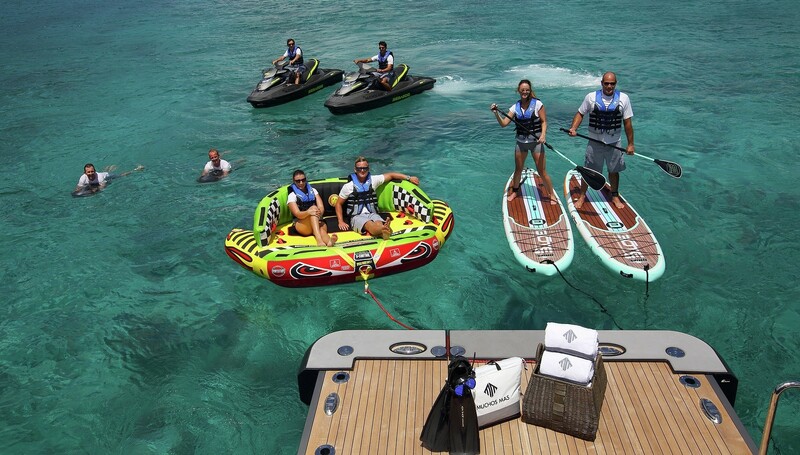 The professional crew of 9 will ensure that everyone has a fantastic time on board throughout the cruise. 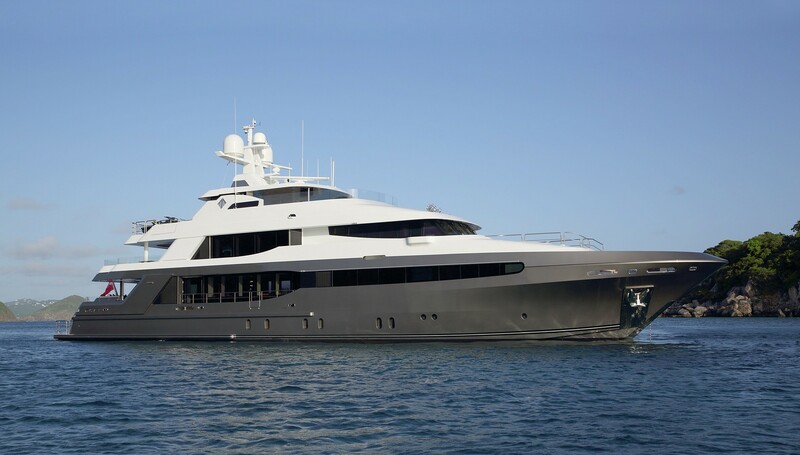 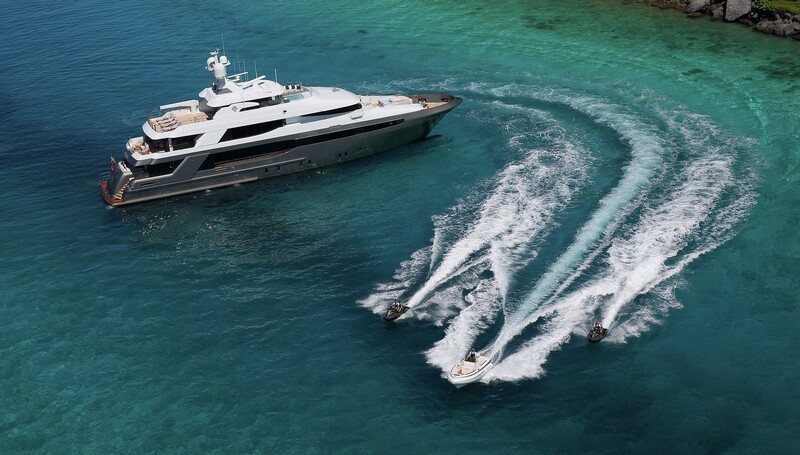 We do have available further amenity, owner and price information for the 44.00m (144' 4") yacht CRESCENT 145 LUXURY SUPERYACHT, so please enquire for more information.